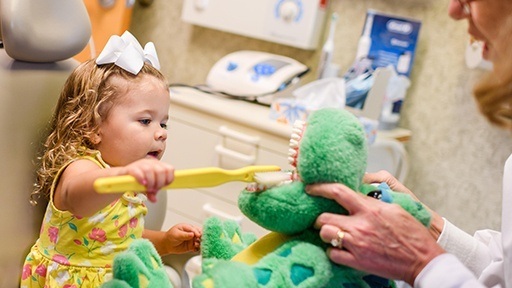 The McCarl Dental Group has been proudly serving entire families for 4 generations, and we would love to welcome your little one to our practice! Early-age preventive dental care is absolutely essential to putting your child on the path to optimal oral health, and our office has a kid-friendly environment that can help even the most nervous toddler feel comfortable. To learn more about all of the ways we can take care of your most precious smile, read on below. Why Choose McCarl Dental Group for Children’s Dentistry? 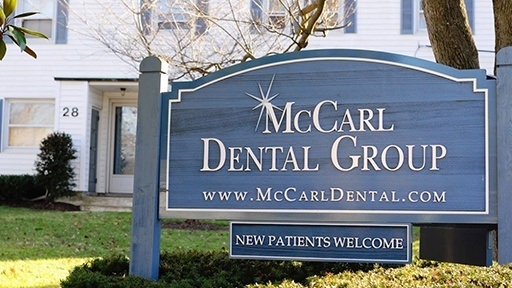 At McCarl Dental Group in Millersville and Greenbelt, we offer dentistry services for patients of all ages. That means you can bring the whole family to one of our two convenient locations for comprehensive dental care that is both kid-friendly and parent-approved. Call the McCarl Dental Group team to schedule your family’s dental appointments all on the same day to maximize your convenience. The official stance of the American Academy of Pediatrics is children should have a dental visit by 12 months old. The idea behind this visit is often education for parents about nutrition, cavity causing foods and drinks, fluoride, and normal tooth development. 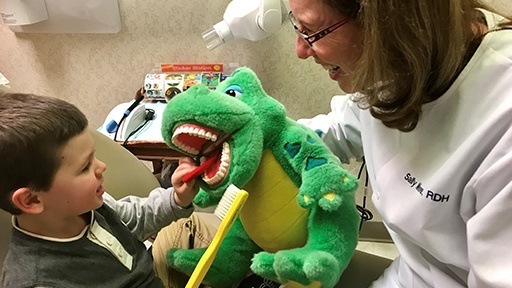 This visit should take place at a pediatric dental office and if your pediatrician refers your child for a dental visit prior to the age of 3, please visit your pediatric dentist. The big nutrition theme is to watch out for sources of sugar such as juice, gummy snacks, milk, and sticky sugars such as fruit bars and raisins. Children will need help brushing their teeth till about age six. Usually children can brush and spit relatively well by six and until then should use a rice sized amount of fluoridated toothpaste while brushing. Try to avoid letting your child put the toothpaste on the brush because too much fluoride can be harmful to tooth development. If you are concerned about the amount of fluoride your child is consuming, contact your dental office. Fun at the dentist? Yes! At our Greenbelt and Millersville, MD dental offices, our main goal for a child’s first visit is to have fun. We strive to create happy memories and experiences that will create a positive foundation for future dental visits. 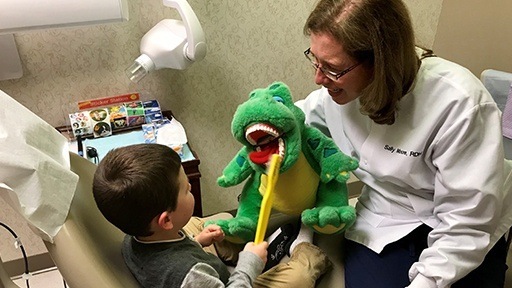 During the initial visit to our dental office, which usually takes place around three years old, children are introduced to Choppers, our toothbrush loving stuffed alligator! They practice brushing and using dental tools on the stuffed animal before we look inside their mouths. We explain the basics of what to expect and use child appropriate language to help them understand what we’re doing. We count, polish, clean, and in some cases put fluoride on their baby teeth. The pace of the visit is set by the child and their comfort level. There is positive encouragement to enable the most effective cleaning possible, but nothing is forced on the child. Again, it’s all about having fun. At the end, children visit the treasure chest to grab a toy and get a goody bag with a themed toothbrush, dinosaur flosser, and bubble gum toothpaste. Yes! Baby teeth are not only used to eat, smile, and talk during toddlerhood, but they are important space maintainers for adult teeth. Having a cavity in a baby tooth does not cause a cavity in the subsequent adult tooth but loosing baby teeth too early due to excessive cavities can negatively affect the eruption of permanent teeth. Starting routine dental care and cleanings at a young age reinforces prevention as the best medicine. 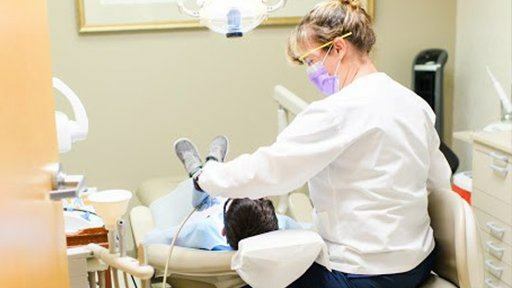 Working together with your dental care provider to create habits and routines that will prevent cavities and, if necessary, fix problems while they are small is key to alleviating fears and making a visit to the dentist fun. Once your child reaches the age of three or four, they should begin to brush and floss on their own. We can help you teach kids to take proper care of their smiles. Our dentists and hygienists will be happy to demonstrate proper technique, recommend oral hygiene products, and help your children achieve their healthiest smiles. Checkups & cleanings – the key to any dental care plan is thorough dental checkups and professional teeth cleanings every six months. 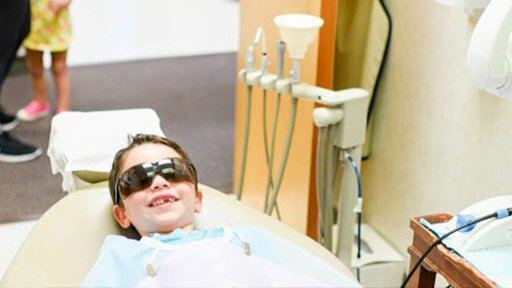 During these appointments, one of our dentists will gently examine your child’s smile, a dental hygienist will clean their teeth, and most importantly, we’ll take the time to answer questions and explain any additional treatments that are necessary to build a friendly rapport with the children we treat. Oral health education – we love helping kids learn how to care for their smiles. Our knowledgeable dentists and team will happily answer your child’s dental hygiene questions, and we are your partners in teaching kids to care for their smiles. Dental sealants – this fast, painless treatment can protect your child’s developing smile for years. We simply paint on a coat of the liquid sealant. Then, a curing light is used to harden it into position. Once in place, the sealant is an invisible shield defending your child’s smile from damage caused by plaque and tartar buildup on teeth. Fluoride therapy – kids who don’t find adequate fluoride in drinking water or who struggle with soft enamel or frequent decay may need topical fluoride treatments. At the end of your child’s appointment, we’ll apply a professional dose of fluoride to boost your child’s enamel strength between visits.